When I tried to add the "Chinese (PRC) - Chinese (Simplified) - Micosoft Pinyin IME 3.0" keyboard layout to the Language Bar in the Windows XP Professional Operating System (OS) notebook, I encountered an error message of "Windows could not properly load the Chinese (PRC) - Chinese (Simplified) - Micosoft Pinyin IME 3.0 keyboard layout". I removed the "Chinese (PRC) - Chinese (Simplified) - Micosoft Pinyin IME 3.0" keyboard layout in the "Text Services and Input Languages" Installed Services, and then re-added it again. However, the error message of "Windows could not properly load the Chinese (PRC) - Chinese (Simplified) - Micosoft Pinyin IME 3.0 keyboard layout" still appeared. As a result, I cannot input Chinese characters in the notebook. 1. Copy the i386 folder from the Windows XP CDROM to your hardisk, eg: d:\i386. Kindly remove your Windows XP CDROM from the notebook after the copying completed. 2. Kindly click "Start" -> "Control Panel" -> "Regional and Language Options". Click the "Languages" tab. 3. If you do not need to use Arabic, Armenian, Georgian, Hebrew, Indic, Thai or Vietnamese languages files (require 10 MB or more of hardisk space), you can skip step 3 and 4, and jump directly to step 5. Check the "Install files for complex script and right-to-left language (including Thai)". Click "OK" after the pop-up prompt on "Install Supplemental Language Support" message. Click the "Apply" button. The system will prompt you to insert the Windows XP CDROM. Please direct it to to the i386 folder (d:\i386) that you previously have copied to the hardisk. After the copying finished, please do not restart your notebook when prompt. 4. Then, uncheck the "Install files for complex script and right-to-left language (including Thai)". Click "OK" after the pop-up prompt on "Remove Supplemental Language Support" message. 5. Please uncheck the "Install files for East Asian languages". Click "OK" after the pop-up prompt on "Remove Supplemental Language Support" message. Click the "Apply" button. After that, please do not restart your notebook when prompt. 6. 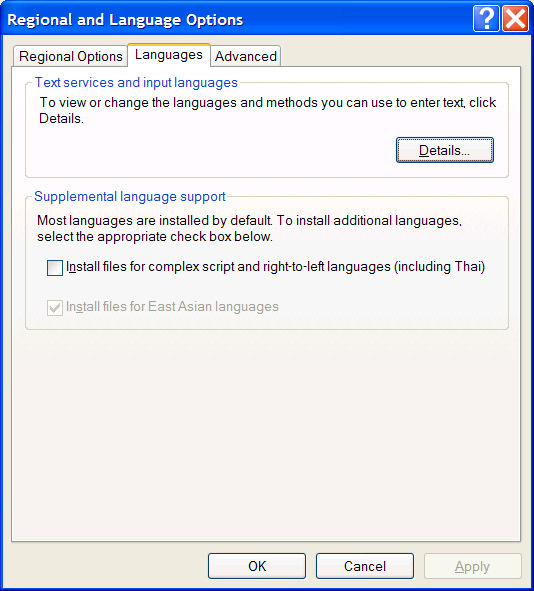 Kindly check the "Install files for East Asian languages". Click "OK" after the pop-up prompt on "Install Supplemental Language Support" message. Click the "Apply" button. You will be prompted to insert the Windows XP CDROM again. Please direct it to to the i386 folder (d:\i386\lang) in the hardisk. After that, please restart your notebook when prompt. 7. 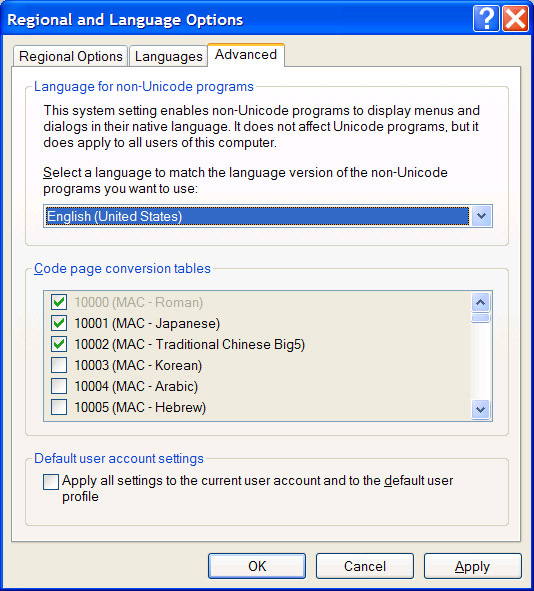 After restarting your notebook and added the "Chinese (PRC) - Chinese (Simplified) - Micosoft Pinyin IME 3.0" keyboard layout in the "Text Services and Input Languages" Installed Services, your IME should work because the error message of "Windows could not properly load the Chinese (PRC) - Chinese (Simplified) - Micosoft Pinyin IME 3.0 keyboard layout" stop to appear. Hmmm....I was looking for a non-restarting resolution, 'cause I didn't know whether it is necessary to restart after changing the additional lang packages, but you just assured me this would not happen so thanks. 2. You don't really need to restart at the end. But since you are using Windows XP and I am using 2003 the story could be different. 1) Thank you for your feedback on the Supplemental Language Support (point 1) on "Install files for complex script and right-to-left language (including Thai)". You are right. I write Japanese language occasionally and thought it is under this categories. After you have pointed it out, I realized that I do not know any of these supplemental languages. I have modified this blog accordingly. Thanks. 2) I play safe by restarting Windows XP after step 6 so that it will re-read the registry to ensure that the registry is clean before performing step 7. Hey! Thanks for the tips. Why do we need copy /i386 to hard disk and install it from hard disk? what's the diffidence between installing from cd-rom or hard-disk? but fail to choose Chinese(PRC) locale after reboot, do you have any experience for that? By copying \i386 to the hardisk, you speed up the copying process because reading from hardisk is faster than reading from CDROM/DVDROM. If you misplace your CDROM/DVDROM, or your CDROM/DVDROM has scratches, you might have copying problem. Once you have pointed the copying process from the hardisk, there will be a registry record and future copying process does not require you to place the CDROM/DVDROM inside the tray again. I do not have Microsoft Windows 2003 OS. In Microsoft Windows Server Enterprise 2008 SP2 OS, kindly go to "Control Panel" -> "Regional and Language Options". Click the "Administrative" tab, and under "Language for non-Unicode programs", click "Change system locale...". Select "Chinese (Simplified, PRC)" and click the "OK" button. A reboot is required after this. Hence, kindly make sure that no users are login to your machine before you reboot.